On Thursday's Larry King Live, future anchor Kathleen Parker verified her tenuous conservative credentials, as she identified herself as a "conservative," but added, "a pox on everybody's house, as far as I'm concerned." She later confessed that she "would put myself...slightly to the right of center," and that she was "a big fan of Barack Obama as he came into office...I didn't want him to fail." 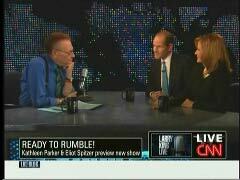 Anchor Larry King brought on Parker and future co-host Eliot Spitzer of "Client Number Nine" fame during the first half of the 9 pm Eastern hour. Three minutes in, King asked about the format of the show, which begins on October 4. After the two briefly described it, the columnist stated that "Eliot is identified as a Democrat and I'm identified as a conservative." Spitzer replied, "Well, you said Democrat/conservative, not Republican," and the resulting exchange led to Parker revealing how she saw her position politically. PARKER: Well, I'm trying to be honest here. SPITZER: Too smart to be that- I understand it. I appreciate that. PARKER: You know, a pox on everybody's house, as far as I'm concerned. A pox on everybody's house, Ms. Parker? By your own admission, you got your Pulitzer Prize for being a "conservative basher." Furthermore, on the April 18, 2010 edition of CBS's Face the Nation, you bashed the Tea Party movement as "dangerous" and compared Internet journalism to terrorism. Twelve minutes later, King raised the issue of President Obama and how many on the left are frustrated with him. He turned to Parker for her take: "Many liberals are disappointed with this administration. How do you feel about him? If they're disappointed, it means he's more to the center, isn't he? So you should be happier with him, by that reasoning?" KING: As a conservative- liberals, as you know- many liberals are disappointed with this administration. PARKER: Yeah, so I hear. PARKER: I think everybody's disappointed with him for different reasons, and I would put myself more in this great big center, but slightly to the right of center. But I was a- I'm a big fan of Barack Obama as he came into office, and was not one of those Republicans who wanted him to do badly. I didn't want him to fail. PARKER: I do think he made a big mistake, though, by tackling these massive policy overhauls, at a time when we were very vulnerable economically, and I think that's obvious now. We've- you know, looking back, it's pretty easy to see that he should have gone after the economy and jobs, rather than health care. KING: (to Spitzer) Has he disappointed you? SPITZER: In certain respects- look, having been in an executive position, I can tell you, it is unbelievably difficult when the world- problems around your plate. He's doing a remarkable job tackling them one by one, and what we should remember- Franklin Roosevelt, two years into his administration, the same place politically. Ronald Reagan, the same place politically that Barack Obama is at. Bill Clinton- same place, and they all emerged, of course, as these stupendous leaders. And so, this is what happens: after the euphoria of victory, there is disappointment. But am I disappointed? On some issues, yes. Wall Street- he hasn't done enough. Three weeks earlier, on the September 8 edition of Anderson Cooper 360, Parker and Spitzer agreed on the Ground Zero mosque issue, stating that "well-spoken" Iman Feisal Rauf changed few minds with his interview on King's program that night, and forwarded CNN's charge that Islamophobia is a growing phenomenon in the United States.